An emotional Janine struggles to hold things together after the traumatic events of her wedding day. Max extends an olive branch to a lonely Jay, but soon angers him. 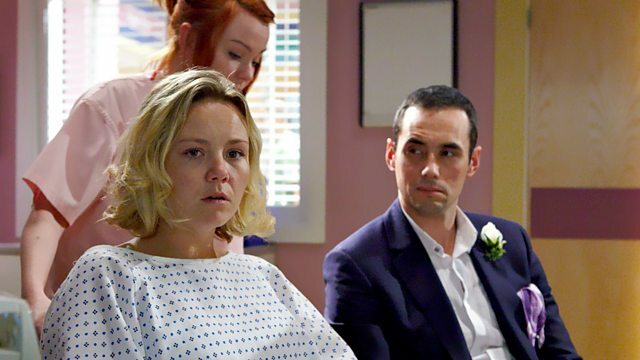 Janine wakes in hospital while Michael watches their tiny baby, hooked up to machines. Janine’s anxious and wants the baby moved to a private ward. Mo thinks Alfie should confront Michael for money. Jean visits the hospital and locks eyes with Michael, but can’t bring herself to enter. Janine struggles to express milk. On the Square, Alfie’s refused a loan. Jean contributes her flower stall wages. Anthony and Tyler leave a photo of the baby, and warn Jean to keep away. Jean stops Kat from revealing the truth about Michael. At the hospital, Michael talks to Ricky about fatherhood, while Diane comforts Janine. At home, Alfie plans a romantic night, but finds Kat asleep cuddling Tommy. At the hospital, Michael sobs as he watches the baby. Suddenly, machines beep wildly and medics rush to the baby. Michael flees. After a row with her mum, Alice moves in with Derek on the proviso he leave Lucy alone. Joey tries to drag Alice home; he and Derek square up to each other. Max bargains with Joey to hear Derek out and gives him £50. Joey gives Derek 10 minutes, timed on his phone. Derek’s pleased when Joey agrees to spend one day together, but Joey tells Alice he’s doing what Derek did - walking away. Morgan’s anxious when Ray and Ricky meet on his birthday. Tiffany tells Ray their kitten ran away. Ray and Ricky clash over the kids’ food. Ricky mocks Ray’s present of a basketball outfit. Morgan wishes they were friends. Tensions ease when Ricky learns Ray never knew about Morgan. Jay pawns Abi’s engagement ring. Jay agrees to help Max with a car. He’s hurt when Max implies Abi could do better. Later, the car won’t start. Max notices Jay and Lola laughing. Jay bins some spark plugs.